This was an experiment in trying to salvage pieces of an old, scrapped game and turn it into something I could release. 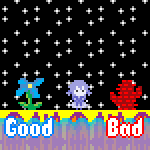 It was an attempt to make a game with an aimless design direction. By this I mean this game was made with no design goals, no direction, and nothing planned beforehand. I wanted to see if it could work and where it would take me. just wow. this game is right up my alley, in terms of environments, narrative, and style. i can't believe how cool this was! it's one of those things that feels like it's mine, like this is MY experience and it is a part of me. with that being said, i'd like to make a few criticisms, knowing fully how janky this was meant to be: a. getting stuck on walls all the time is really frustrating. this is huge! i was compelled enough to work my way through, but this was kinda difficult to deal with. b. sometimes there's just no sound at all, when a simple ambience would have worked. or maybe that was intended, but i could have used a teeny bit of something.c. i was gonna say the book puzzle and getting inside the grey house were a bit obtuse, but i'm just not very good with interpreting clues, lol. but yeah, this was such a great experience, can't thank you enough for it. The screenshot makes me realize that I haven't seen all of the game yet and reminds me that I was substantially surprised with my incomplete playthrough a few weeks ago. When I was in college, meta-narratives that created a feedback effect by applying to themselves seemed like the epitome of literature to me and I found myself always writing those. In the last five years or so I've been moving farther away from that kind of plot-centric perspective that depends on *meaning* being a well orchestrated paradox of a demonstration describing itself. I always knew that this 4th-wall priority limited the subject matter to the medium is presented within itself, but an awareness of the medium/material in which the presentation is embedded seemed like a form of honesty in art that I couldn't help but value (but as I find more and more of it, I find it less and less worthwhile). This game reminded me of what attracted me to recursive meta-narratives in the first place (even though this isn't necessarily recursive). There is something so neat to me about the inhabitants of a narrative being aware of their own framework and reacting to that knowledge. It is significantly different to me that an author stepping in as a narrator and stating something about the process. While the latter creates a defacto rhetoric of literal author-ity, the first feels so much more severe and frightening for me. The realization that we create is horrifying to anyone with empathy. It implies a level of responsibility I'm uncomfortable with, but which I am incapable of remaining ignorant about. New version is up. Hopefully is plays better/worse than before.